Thousands of people have rallied in the center of Georgia’s capital, Tbilisi, calling for the government’s resignation. The march was organized by the party of ex-president Mikhail Saakashvili who is under investigation for corruption and abuse of power. 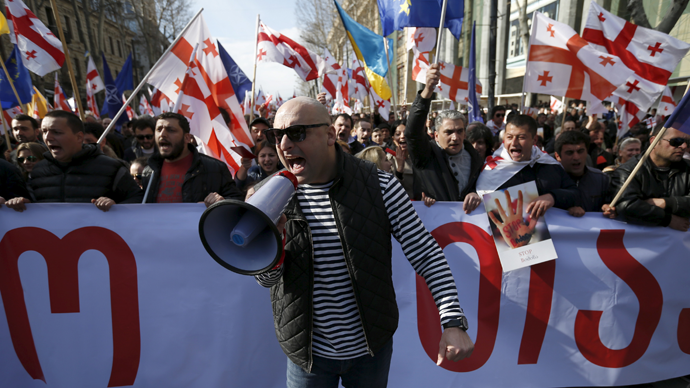 The participants of the rally inspired by the former president’s party, United National Movement (UNM), marched on Saturday through the center of the city carrying Georgian, EU and NATO flags to the Georgian government office. The activists handed over to the government a symbolic “red card” and let balloons fly into the air. According to the police, the number of participants reached 10,000-15,000 although the organizers of the event put the number closer to 50,000. The UNM and activists accused the ruling coalition government of mishandling the country's economy which led to economic slowdown, a 30 percent currency devaluation, and increasing inflation and unemployment. “We will very soon liberate Georgia from these dark, inactive forces and return Georgia to a shining path,”the former president, who appeared on a giant screen placed in the square, told the activists. The UNM is seeking to start the process of the impeachment of the government, MP Sergo Ratiani told journalists as cited by RIA Novosti. Mikhail Saakashvili became Georgia’s leader after ousting his predecessor, Eduard Shevarnadze, in the 2003 public uprising dubbed the Rose Revolution. He took a strong pro-American stance, hiring a number of Western advisers to help his reforms and campaigned for Georgia’s accession to NATO. He enjoyed notable successes in reducing official corruption, cracked down on powerful crime rings and gave a boost to the country’s economy with a combination of liberal reforms and foreign loans. However, relations with Moscow deteriorated dramatically under Saakashvili, who is noted for his strong anti-Russian stance, which reached its peak when Georgia launched the August 2008 offensive against South Ossetia. Saakashvili’s successor, Georgy Margvelashvili, the head of the Georgian Dream coalition and a political protégé of Saakashvili’s principal foe, billionaire Bidzina Ivanishvili, won the presidency in elections in 2013. Last summer, Georgia’s Chief Prosecutor’s Office launched proceedings to indict the ex-president and place him on an international most-wanted list. The ex-president faces numerous charges, including embezzlement of over $5 million, corruption and brutality against protesters. Since his presidential term ended, Saakashvili has lived in exile in the United States and later in Kiev, Ukraine. Saakashvili was offered the position of first deputy prime minister of Ukraine last December, but he refused the appointment, saying he doesn’t want to renounce his Georgian citizenship. In February, Saakashvili was appointed a non-staff adviser to Ukrainian President Petro Poroshenko. Later in February, Ukrainian authorities refused to extradite Saakashvili to Tbilisi, Georgia’s Chief Prosecutor’s Office said.